The Assassin’s Creed games are an interesting lot. On one hand, you get these big open world areas that you can explore with each game diving into a different area of history. 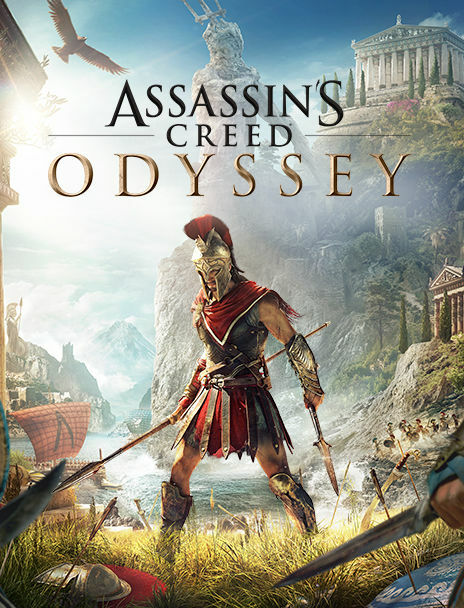 In Odyssey, it explores the world of ancient Greece in a time where Sparta and Athens are at war with each other. You can captain a boat and cruise the high seas, wander the forests and hunt deer, climb mountains, explore islands you’ve probably never heard of, and walk the streets of towns that likely no longer exist. On the other hand, Assassin’s Creed is a combat game focused on ridiculous assassination skills. While there is no palm dagger in Odyssey, there is a broken spear with which you can dispatch your opponents with gravity defying acrobatics. Or you can just hack and slash your way to victory. Either way, it’s a game that merges violence and beautiful scenery to create a 3D world you can escape into. The story, however, is another matter. Let’s touch on the story. With these games there are two levels of story at play. One story takes place in modern times with people using devices to travel back in time via memories to experience past events. In that story, you are Layla Hassan. To be honest, she is not important at all. In a game where you’ll be spending 30+ hours to beat the main story, you’ll be spending 99% of your time in Greece, not in the real world as Layla. There’s only three times where you’ll actually get to be Layla. Two of those times you’re stuck in a little apartment with some easter eggs you can look at that talk about events in past games or hint at other Ubisoft games. The other event is a bit cooler, but underdeveloped and still boring. You get to go scuba diving through an underwater cave and find the sunken city of Atlantis. However, all you really get to do is swim through a dark cave, walk through a big room, and then do a simple light puzzle that activates an ancient artifact that talks to you. I spent the whole time wondering how quickly I’d get to go back to Greece because that’s where all the fun’s at. The modern layer of the story is very uninteresting as there is no investment in it. The game doesn’t push the importance of that aspect, why you should care about these people, or what they’re trying to accomplish. So let’s move on to the second story, the main show – ancient Greece. Do you want to live out your 300 fantasies of kicking people off ledges and yelling “THIS-IS-SPARTA!”? Well good for you as you can do exactly that. Maybe you’re old school and want to pretend to be one of the mythic heroes of Greece, exploring the world and slaying the fabled beasts of legend. You’re in luck, some of those mythic beasts are in the game. There’s even a gladiator arena where you can get a little bit of a taste of that, but not enough to really scratch your “Are you not entertained” Maximus fantasy. But still, there’s a lot of cool things you can do. On top of that, there’s two ways to enjoy the game – slaying your enemies or exploring the world. First, there’s laying waste to anything that dares challenge your mythic quest to greatness in the Greek world. You see that goat? Go ahead, hit it with a war hammer and collect it’s hide to upgrade your weapons, armor or even your warship. Did that merchant look at you funny? Draw your sword, cut them down, and then have fun with the bounty that’s put on your head. Now you get to deal with the local soldiers or wandering mercenaries who populate the world. Perhaps that mercenary gets you thinking, how many of these people are there? And why am I not the best mercenary in all the land? Well, if you want to, and given time, you can indeed defeat every mercenary, steal their gear, and become top dog of the soldiers of fortune. Plus they even regenerate with new mercs in case you get bored and want to fight some more. If you get bored of that, you can move on to assassinating local leaders and commanders of military encampments and forts. Cause enough destruction, and you can fight in battles between Sparta and Athens where you constantly get to choose which side you want to fight for. In this game, you’re a mercenary first and foremost, so allegiances don’t mean much. You can try to be loyal to one side if you want, but there’s no real harm in changing sides in this game. Eventually, if you get bored of the land, you can move on to the sea where you can shoot arrows, javelins, and ram ships in two. You can continue you’re war on Athens, Sparta, attack merchant ships, or fight pirates. And if you decide to dive into the ocean and start exploring there, you’ll get to fight sharks. As mentioned earlier, there are some epic monsters in the game, like the minotaur. There’s also a story involving a group called the Cult of Kosmos which will unlock a giant bracket of people you can kill for epic loot. But what if you don’t want to kill things or you get tired of the mindless slaughter? Well, there’s a very big world to explore. You can walk it, ride a horse across it, swim through its depths to sunken ruins, sail your boat to far off islands, climb mountains for spectacular views of the world, and even enjoy different weather and times of day. With all the towns and cities, there are plenty of people with missions for you to complete, and not all of them are violent. Sometimes you’ll be delivering goods, other times you’ll be treasure hunting. And when it comes to exploring, you have your hawk which you can switch to and just fly around the world in search of things. Thus, there’s a lot of things you can do without ever even touching the main story. But what about the main story? You can play as either Alexios or Kassandra, siblings who are thought dead and separated from their parents. Whoever you pick, you’ll be a mercenary on a far off island who gets drawn into a search for your parents. This leads to one of three main storylines. You’ll go through a bunch of stuff as you reunite with your dad and get to settle old scores. You’ll go off in search of your mother, you’ll go up against your lost sibling who is now a power crazed, rage infused tool of the Cult, and in the end, you can reunite everyone peacefully, or lose them all to good old death. You can actually get an ending where any number of them live or die, so there’s lots of variations possible. The second storyline is the Cult of Kosmos. They’re the cause of all the pain in your life, so you can stop them, if you want. Or you can join them. The game is all about choices and options. The reason it’s a second storyline is that missions are separate from the whole family storyline. You can actually finish one before the other, in either fashion. It’s pretty straight forward – the Cult is this secretive group that wants to rule the world and is playing both sides of the war between Sparta and Athens. Most of them are corrupt and evil, so getting rid of them is a good thing. The third story is the sunken city of Atlantis, which ties in with your family, and leads to a return to the real world for the scuba diving mission. This is suppose to be the real world modern story. So here’s the thing which will probably become pretty evident when you start playing – the writing in this game is very weak. The dialog is not great. This leads to a weak story in the game. The real world story is very underdeveloped and feels like it was added in as an after thought. The Cult of Kosmos storyline gets a lot of investment as you hunt down all the members, see all the pain they’ve caused you, and finally work your way to the leader and wiping them out for good. But that culmination isn’t even a final boss fight. Instead it’s a cut scene where you get a couple dialog options that decide the fate of the last Cult member. And that’s it. No after movie scene to reward your decision – good or bad. It just ends and you go about playing the game like nothing happened. It’s very unsatisfying. The family storyline is also a let down. I wound up saving everyone, but it just ends with a final cut scene of you having dinner with your family and all the members you saved. Once that’s over, it’s back to the game like nothing happened. Here’s the thing, as weak as the story and the dialog was, I still really enjoyed this game. I enjoyed it despite its shortcomings. Why? Because who needs a main story when you can ride around on a unicorn or a flaming skull horse? Who needs a storyline when you can explore ancient ruins to find legendary monsters you can fight. Shortcomings aside, I had hours and hours of fun just climbing mountains to upgrade my hawk or searching for rocks and trees to upgrade my weapons. I liked completing the underwater ruins to unlock new looks for my boat and crew. I had fun beating mercenaries and Cult members, unlocking awesome armor and weapons, and then realizing that you can change any piece or armor or any weapon to make it look like any other item you’ve already acquired. Don’t like the look of Achilles armor but love the perks it grants? No problem, change it to your favorite looking gear. I loved that! I probably spent hours just constantly changing the look of my helmet as I’d get bored of one and moved on to a new one. A mercenary king of the Greek world should look epic after all. So weak story aside, the customization, the options, and the beauty of the world they created are enough to earn Odyssey a place in your console. I give it a four out of five metal bikinis.